When does a music star become a superstar? In the case of Madonna, it was with the release of Like A Virgin and her chart-dominating run of hits in 1985; with Michael Jackson, it was "Billie Jean" and his debut of the moonwalk. In other words, it's when an already successful artist makes an even greater impression, going from being just a popular performer to a pop culture icon. This week in 1984, a singer/multi-instrumentalist with a couple of top 10 hits to his name debuted on the ARIA singles chart with the lead single from an album (and movie) that would take him to that next level and give him his first number 1 hit locally. For a third and final week, the number 1 single in Australia was still "It's Just Not Cricket" by The Twelfth Man, but even the cricket parody couldn't withstand the might of the rapidly ascending Wham! The original by Gladys Knight & The Pips had been a US top 5 hit following its release in late 1973, but this slightly renamed remake didn't enjoy the same chart trajectory. Their commercial breakthrough was still a couple of years away, but live favourites The Cockroaches finally poked their heads into the top 100 with their sixth single. Despite having plenty of singles as good as "Vienna" (a list that also includes "The Voice" and "Hymn"), nothing else Ultravox released ventured into the ARIA top 50 - although this UK number 3 hit came closest. His albums either side each yielded an ARIA top 5 hit, but the best effort from Man On The Line was this lead single, which veers more towards "Don't Pay The Ferryman" than "The Lady In Red". I've already covered their subsequent two top 100 appearances here and here, but this was the first - and highest charting - single they released and was apparently produced by Molly Meldrum. 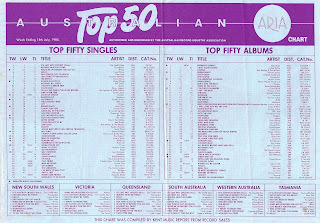 It was welcome back to the Australian chart to a band who hadn't been seen on the top 100 since "Just Can't Get Enough" reached the top 5 in early 1982. Since then, Depeche Mode had lost their main songwriter (Vince Clarke, who'd gone off to form Yazoo then The Assembly), found a new one in Martin Gore and released the song that remains their best ever single. But it was actually this lead single from fourth album Some Great Reward that would finally give them another hit locally - probably because it was the poppiest thing they'd done since "Just Can't Get Enough". The fact "People Are People" is so catchy would also explain why it became their highest charting single in the UK (equalled twice but never beaten over the decades) and their first hit in the US. Naturally, the band hate it and haven't played it live in nearly 30 years. Depeche Mode might not have had many hits in Australia, but they'd done better than this guy's band, 2017 Rock And Roll Hall Of Fame inductees Journey, who didn't get any higher than number 43 with 1982's "Open Arms" (a US number 2). Steve Perry more than made up for that with his solo debut - one of the best power ballads of the decade. Released in between Journey albums, "Oh Sherrie" replicated its US top 5 performance here in Australia. It was a one-off though, with Steve never returning to the top 50. I don't think I've ever watched the music video all the way through before - the behind-the-scenes premise is quite fun. And, of course, it features Steve's then-girlfriend, Sherrie Swafford, about whom the song was written. While his on-off friend Marilyn was languishing outside the top 50, Boy George and Culture Club not only racked up yet another hit, but did so with the fifth single from Colour By Numbers. Released instead of "Victims" in the US, the upbeat "Miss Me Blind" didn't come out in the UK, but the band's Australian record company clearly believed they could squeeze out one more hit from the album. And they were right - even if it did become Culture Club's first single since their breakthrough to miss the top 20. Whatever fuss there'd once been surrounding Culture Club had long since died down with Frankie Goes To Hollywood assuming the mantle of Britain's most controversial band. For their second single, they traded sexual innuendo for political satire, with "Two Tribes" tapping in to the simmering tensions caused by the Cold War and the fear of nuclear war. Musically and visually, the song exploited the conflict between the USA and the USSR - in the song, elements of Russian classical music sat alongside modern American styles, while in the music video, actors made up to look like Ronald Reagan and Konstantin Chernenko engaged in an all-out brawl. The topical track was another huge hit for FGTH - in the UK, it spent nine weeks at number 1, selling over 1.5 million copies in the process; in Australia, it was the 20th biggest single of the year despite only reaching number 4. In both countries, the success of "Two Tribes" resulted in "Relax" climbing back up the chart, with the earlier single returning to the ARIA top 50 in late August. Laura Branigan had done very well for herself by covering an old Italian song and changing the lyrics to English, with "Gloria" becoming a major worldwide hit in 1982-83 (and she'd repeat the trick with "Ti Amo" in a couple of singles' time). With "Self Control", she did very well by remaking yet another song by an Italian singer - but this time it was one that was already in English. The original version by Raf was also released in 1984 and in some countries the two recordings charted contemporaneously. 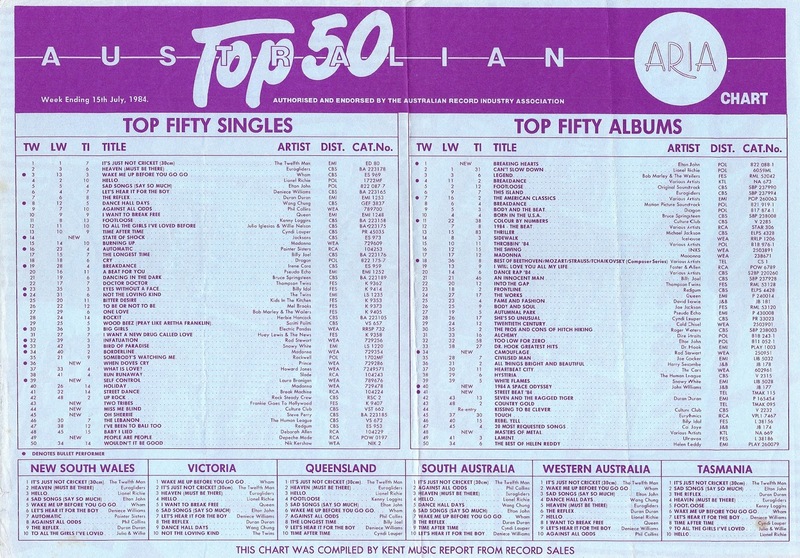 In Australia, however, Laura had the top 50 all to herself and her take on "Self Control" (which I have to say I prefer) took her back into the top 5 for a third time. You know you're a new kind of famous when you star in a movie based on your life, which is exactly what Prince did with 1984's Purple Rain. Taken from the film's soundtrack album, "When Doves Cry" eclipsed all his previous singles, reaching number 1 in Australia and also in the US, where it was the biggest song of the year. Unlike his later movie projects, Purple Rain was also a commercial and critical success, and a steady stream of hits were issued from the project. For the time being, Prince could do no wrong. Although the Purple Rain album was credited to Prince & The Revolution - his first release with his new backing band - "When Doves Cry" was credited solely to Prince, who performed everything on the track and made the decision to leave out the bass line for a more minimalist effect. The song has returned to the ARIA chart on two occasions since 1984 - in 1997, Quindon Tarver's remake from Romeo + Juliet reached number 3, while Prince's original shot back to number 11 shortly after his death. On a side note, it's nice to finally be able to embed a music video to go with one of my write-ups of a Prince single, since his clips are starting to surface on YouTube. While Prince ascended to superstar status, Michael Jackson was basking in the glory of what would end up being the world's highest-selling album of all time. Before he began work on a follow-up to Thriller, he reunited with his brothers - all five of them - for his final album as part of The Jacksons, Victory. As well as being the only album to feature the six Jackson brothers, it would be the group's best-selling release, boosted by the success of this lead single. Originally recorded (but not released) as a duet between Michael and Freddie Mercury, "State Of Shock" ended up as a collaboration with Mick Jagger instead - and their combined star power resulted in it hurtling into the chart at number 14. It only progressed a few more positions, becoming The Jacksons' final single to make the top 10. Next week: can you believe - another breakdance song? Plus, a dance remake of a song that'd first appeared in a film in 1967. Haven't heard State of shock in years! I remember hearing the song in Moonwalker a little after MJ passed away & I watched the video for both this song & The Jackson's Torture. I was a little creeped out of Prince's video of When Doves Cry. 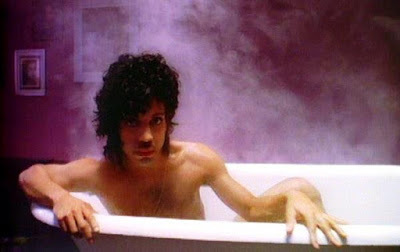 Terrific song but the intro of him coming out of the bathtub shows his sexual character & is somewhat bizarre. I love both Two Tribes & Relax but Two Tribes would be my preferred thanks to it's high energy/synth beat although Relax sounds somewhat similar. Gloria remains my favourite Laura Branigan song although Self Control is a very decent song nonetheless. People are People is a pretty underrated song. Of course "Just can't get enough" is a top synthpop track but it's the only track which I hear from them these days. I enjoy hearing other songs too like this one, Enjoy the silence, Personal Jesus, Everything Counts. Pretty sure I only knew 'Vienna' by Ultravox at the time. I got to know 'Hymn', eventually, through a trashy dance cover of it appearing in a dance medley Hitz FM used to play in the 90s. This one is pretty good. I think I've commented before that if Enya was a man, she'd be Chris DeBurgh (looks-wise). This video re-confirms that. I still can't picture Molly being a producer (other than perhaps the 'executive' or Pete Waterman sort), or even a musician. I didn't know Depeche Mode hate 'People Are People'. I don't really remember the song from 1984, but it sounded vaguely familiar when I re-heard it in the 90s. It's a shame none of the post-'Just Can't Get Enough' singles before this one charted. I remember 'Miss Me Blind' from the time, but not 'Victims'. I vividly remember 'Two Tribes', 'Self Control' and 'When Doves Cry' from 1984, and seeing their striking videos on Countdown. I wanted to get the 'Purple Rain' soundtrack (but didn't), but got the 'Self Control' album, from which the title track remains a classic. I find both 'Self Control' and 'When Doves Cry' haunting, but compelling. Interesting that the embedded Laura Branigan video is a hybrid 'live' footage one instead of being the original video. I like the Raf version too, but think Laura's is an improvement. I don't remember hearing 'State of Shock' before, or even being aware of its existence. How odd. Can't say I need to hear it again though.